Domestic sales increased 6 percent with 52,500 units sold in the past month. Mahindra have released their sales report for January 2019. Total sales stood at 55,722 units, up 7 percent as compared to 52,063 units sold in January 2017. Taking only domestic sales into account, the company experienced growth of 6 percent with 52,500 units sold in January 2018 as compared to 49,432 units sold in January 2018. A marginal increase was also noted in the Passenger Vehicle segment, which included cars, vans and utility vehicles, from 23,686 units sold in January 2018 to 23,872 unit sold last month. YTD sales in the Passenger Vehicle segment stood at 2,00,561 units in F18 which went up to 2,00,946 units in F19. A notable increase was noted in sales of cars and vans with a 29 percent increase from 12,261 units in Y18 to 15,734 units in Y19. 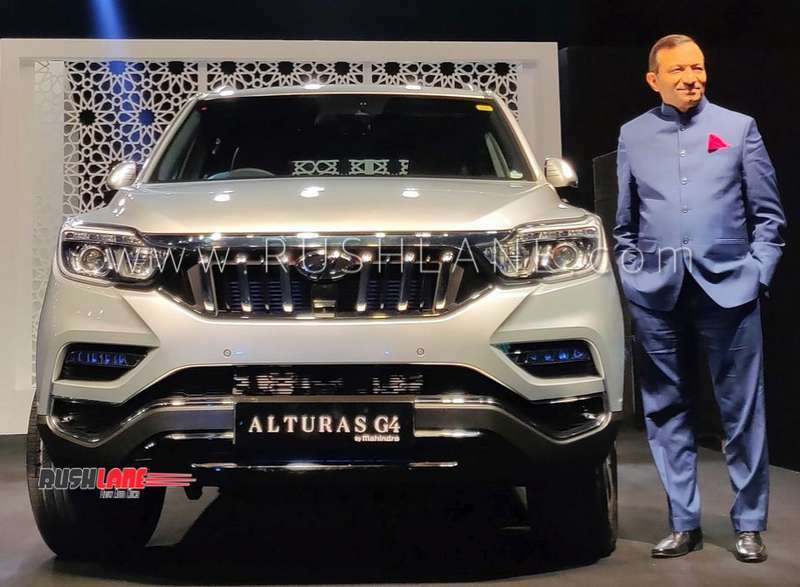 Dr Pawan Goenka with the new Mahindra Alturas. Growth in the Commercial vehicle segment stood at 8 percent. The company had sold 21,002 units in January 2018 and 22,625 units in January 2019. Taking only Medium and Heavy Commercial Vehicles into account, the company sold 849 units in January 2019. Exports in the past month increased 22% to 3,222 vehicles. The three wheeler segment also noted a 27 percent increase in sales with 6,003 units sold last month. YTD figures in this segment increased 26 percent from 42,885 units in Y18 to 54,104 units in Y19. Total YTD domestic sales increased 11 percent from 4,13,807 units in Y18 to 4,58,074 units in Y19 and total exports surged 43 percent from 22,143 units in Y18 to 31,565 units in Y19. This took total sales – domestic and exports up 12 percent from 4,35,950 units in Y18 to 4,89,639 units in Y19. The company reported a 1 percent increase in tractor sales from 22,065 units in January 2018 to 22,212 units in January 2019. Domestic tractor sales also increased 1 percent from 20,822 units in January 2018 to 20,948 units in the past month. Exports in this segment were up 2 percent to 1,264 units from 1,243 units in January 2018. The new Alturas and Marazzo have been well received and the company looks forward to the launch of the new XUV300. Mahindra January sales fared well due to a dip in fuel prices coupled with buoyancy in rural markets, leveling of commodity costs and an improvement in Forex.